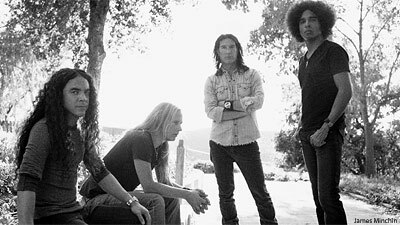 Alice In Chains' first studio album since the death of singer Layne Staley and introduction of William DuVall leads with these telling words: "A new beginning/Time to start living ... There's no going back ..."
The song from the new album, 'Black Gives Way to Blue,' out Sept. 29, is called 'All Secrets Known' and eases into a set of moody hard rock songs that, like past Alice In Chains subject matter, draw on the turbulence of life. "'All Secrets Known' almost didn't make this record," says guitarist/co-vocalist Jerry Cantrell. "It wasn't because the song wasn't something we believed in. It was just there was so much material to focus on; for some reason, that one got pushed to the side. "I remember talking to [drummer] Sean [Kinney] and said, 'That song is really important, especially what it says. If we don't do it on this record, we probably won't be able to do it again because it's kind of referencing this whole thing." 'This whole thing' is Alice In Chains rising from the Seattle music scene in the early '90s to become one of the world's biggest rock bands, selling more than 17 million albums with such full-lengths as 1990's 'Facelift,' 1992's 'Dirt' and 1995's 'Alice In Chains' -- and then, in 2002, the news that their increasingly reclusive frontman had died of a drug overdose. The band members continued to work on various projects. Cantrell had already put out his debut solo album, 'Boggy Depot,' in 1998, and had his second, 'Degradation Trip,' ready to go when Staley died. He dedicated the album to his late friend. In 2005, the surviving members -- including Mike Inez, who had taken over from Mike Starr in 1993 -- performed together at a charity concert in Seattle for the victims of the tsunami with DuVall as the lead singer. Cantrell had been using his band, Comes With the Fall, to back him on 'Degradation Trip' shows. "It wasn't necessarily about finding somebody who was gonna save us or something," Cantrell laughs. "It was about finding somebody who could add to the band and also to represent the way that we work. This band has always been a two-vocal band, and Layne and I created a vocal style and a writing style together. "Of course, the prospect of moving on with him was not a light undertaking by any means, and it wasn't some sort of a grand plan either. Just one thing led to another and we kept taking the next step." 'Black Gives Way To Blue,' produced by Nick Raskulinecz (Rush, Foo Fighters), flows like an old-school album, from 'All Secrets Known' to the closing title track, a soaring tribute to Staley sung by Cantrell and featuring Elton John on piano. "It's a really tricky thing putting a record together as far as playing order. We're trying to create a whole thing here from top to bottom that's worthy," says Cantrell. "The one thing I always admired about being in this band is, as a group, what it takes to represent an Alice In Chains song and an Alice In Chains record is a pretty stringent requirement. It's got to speak to everybody and it's gotta fit together, and I think the way that the album runs together, and also what is being said, is very important."